Research Institutes, Medical And Pharmaceutical Laboratories And Agriculture Soil Testing For Determination Of Moisture Equivalent Of Soil. 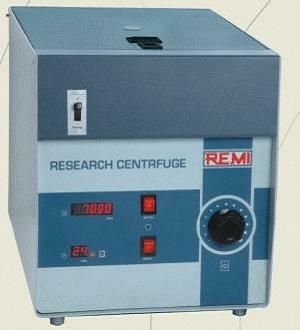 R-24 Is Useful For Research Work In Medical, Pharmaceutical, Industrial And Research Institutes. It Is Also Suitable For Determination Of Settlement Of Paints, Pastes, Cosmetics And Food Products. The Unit Is Housed In Powder Coated Sheet Steel Housing, Compact In Size And Streamlined In Appearance Having Front Panel Where Controls Are Mounted. �	Stepless Speed Regulator With Zero Start Interlock. �	0-99 Minutes Digital Count Down Timer. �	Imbalance Detector With Cutoff.